Some of the free gear on offer. 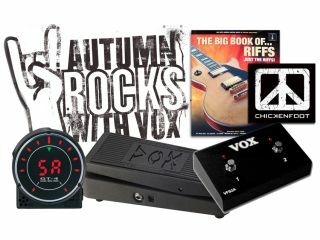 PRESS RELEASE: Keep rocking this autumn with Vox. Essential FREE gear with selected VOX purchases! Once you have bought your new Vox, all you have to do to claim your free product is to download the claims form from www.voxamps.com and follow the instructions. Then just wait for the post to arrive! FREE Chicken Foot CD when you purchase any item from the VOX Joe Satriani pedal range! Offers end 30th November, so get along to your local Vox store and grab yourself some free gear.